If you are in fashion, see Dior and I. If you are thinking about going into fashion, see Dior and I. If you appreciate art, hard work and a touch of drama, see Dior and I. 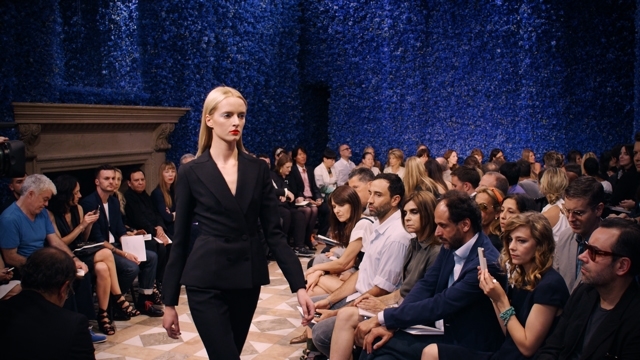 This is a no holds barred, access all areas documentary focusing on the newly appointed Creative Director of Dior, Raf Simons, who in Spring 2012 had just eight weeks to put together his first haute couture show (usually they have six months, so you can see the urgency). I knew I was sold on this movie as soon as I saw the trailer. Raf Simons is standing on the rooftop of the venue which will host his first show as the fashion press and celebrities start to gather beneath him. He's drinking, what I can only assume is hard liquor, says simply; "Ooh la la la laaaa. Oooh." I mean, is that not the best sentence ever? For this is a working living breathing business. For every minute spent concentrating on making the new vision happen, there is another minute spent on satisfying the commercial aspects of the business. The struggle between creative and commercial shows up time and time again but it probably most obvious in a heated discussion when Raf finds himself at a fitting minus dresses as head of flou, Florence, has flown off to New York to do a fitting with a high spending client. One which in fact spends 350,000 euros per season so ironically providing the cash to allow the brand to put the next fantastic show on. "You cannot say no to me," says Raf as he pushes through his authority as the pressure mounts and thus, with a flurry of activity, dresses suddenly begin to arrive. The atelier is stacked with personalities and as if to counterbalance, Raf's creative vision is measured and thoughtful. Raf himself has been called a 'minimalist' by the industry through his time at Jil Sander which he refutes. "I am not," he says explaining that he was merely working for a brand which was minimalist. Of course, everyone forgets that one moulds to the brand they are working on. So what is his plan? "I want it to be dynamic as I find women are dynamic," Raf states his intention of creating a collection referencing the authentic Dior brand but making it modern. In an effort to get into the Dior spirit, Raf gets to know every member of staff, starts reading Christian Dior's book and visiting Dior's childhood home. Raf's personal brand is also very considered. “Raf has a uniform – his clothes are bordering on clerical, although with completely outrageous shoes," Tcheng notes. It is an emotional process, so much of haute couture is lengthly, intense and specialist. The team pick their individual gowns to work on and as one seamstress says that it is her 'first draft' and even if Raf changes it, it was still her first interpretation of his sketch. Yet as much as Raf signals the modern, it is a suprisingly traditional process. Tcheng uses the words from Christian Dior's book to form the structure of the film and they become the narrative woven through it. "Everything that was happening in front of my lens matched, almost to the last detail of character or emotion, what Christian Dior had described in long chapters about the making of a collection. History repeats itself," Tcheng says. The haunting presence of Monsieur Dior is intentional as Tcheng uses this to demonstrate the expectations on Raf and the extracts from Dior's book plus the historic montages bring depth and glamour to this film. Raf's task was to carve out his own path at Dior, weaving hs love of art and modern techniques into the collection. This jacket below which went out first onto the runway was pivotal. Originally in white, Raf asks ""How fast can you make a jacket like that in black?" The answer, take it into the garden and spray paint it - voila! Sometimes it really is like that in the fashion arena, a little smoke and mirrors go a long way! What cannot be faked in any way was the glorious floral walls which decorated every room for the Dior show. Don't you wish you could have taken in the beautiful fragrance of those thousands of flowers? Even Anna Wintour was suitably impressed. "I was just admiring the flowers. You didn't have any budget issues then." The scene was set for a magical show and Raf, demonstrated understandable pre-show nerves. The moment on the rooftop or the, 'Ooh la la la la. Oooh,' moment as I prefer is real as he is brought to tears, you know exactly what it means and that his creative soul is about to hit that runway. The emotions run high in any creative process, and this has added commercial aspects from the financial costs of the flower filled rooms to the press and celebrities who are the judge and jury. All the team get swept up in the moment, there is heart here, genuine people trying to do their best and getting excited about the magic and beauty of fashion. In the end, of course it is a success. The intricate, stunning flowers 'it will look like Versailles in here' are the perfect backdrop for a collection that brings together the history of a fantastic brand with modern touches. Like any true creative, the thought of walking on stage for his applause is almost too much for Raf who tries to avoid it. This seems to rhyme true to the great Monsier Dior himself with this extract taken from his book. "There are two Christian Diors—Christian Dior, the man in the public eye and Christian Dior, the private individual—who seem to get further and further apart.” But in the end Raf takes to the stage, he has stepped up, quite literally to the big stage. Eight weeks ago he was standing in the atelier saying; 'couture is new to me,' and lucky for him the response he got was; 'we can help you.' Raf brings new modern vision to Dior and he has a very talented team which transform it into the most beautiful waist cinching couture and art influenced pieces. It will make you want to make a dress immediately. As they say many times in the film - sublime! Dior and I is in UK cinemas now - see HERE for more details on how to book tickets.